I’m sure you’ll have heard this track and I’ve been meaning to include it here for a while. It’s an electronic dance track which samples the main riff from “Papa’s Got A Brand New Pigbag”. It reached number 16 in the UK charts last week. More info at Alex Gaudino’s website – www.alexgaudino.com – which currently has the track playing in the background on the front page. Here’s hoping the Pigbag guys are getting their royalties on this. I recently had an email from Jim to say that he’s resumed his electronic music making after a 10 year break. You can check out a couple of his new tracks at the ATOMM MySpace page or play with the whizzy Flash page at www.atomm.co.uk. Starekits – the band that Angela Jaeger was in in New York City in 1979 have a MySpace page. Go to http://www.myspace.com/starekits for some retro-Angela sounds! Two tracks by Hardware (James Johnstone’s pre-Pigbag band) are available on a compilation CD by Chuck Warner of hyped2death.com. The tracks “Speed Unit” and “Face the Flag” taken from Hardware’s EP’s. The CD’s come with a very comprehensive booklet with details and images of all the bands featured, the conversion to digital is managed really well. The CD is available by mail order – Messthetics 103. GRACE / WING will be performed by Angela Jaeger through voice – text – drawings, accompanied by tapes and a snare drum. 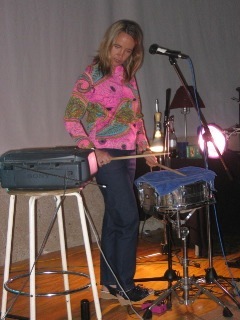 Angela Jaeger is a New York-based singer who has recorded and performed with a diverse group of musicians including PigBag, The Drowning Craze, Bush Tetras, Billy McKenzie, David Cunningham, Amy Rigby, Jim Sclavunos and Alan Licht. She recently gave a debut joint reading of her Punk Diary project with writer/journalist Byron Coley at Issue Project Room and is currently shaping this material into book form. Jutta Koether is a New York-based German painter, writer, rock and art critic, musician and performance artist, with projects often interlacing all of these assumed roles. She has exhibited widely at a range of international galleries including Galerie Daniel Buchloz (Cologne), Reena Spaulings Fine Art (New York), White Columns (New York), Kunstlerhaus Vienna, The Swiss Institute (New York), and is a contributor to publications such as Artforum and Afterall. Koether regularly collaborates with Kim Gordon on installations and performance projects.